To me, containers are secondary to what's inside of them. 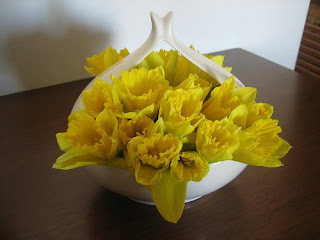 If you arrange flowers, you probably have a favorite vase (mine is a gravy boat) but I think a bouquet can look gorgeous in just about any vessel. 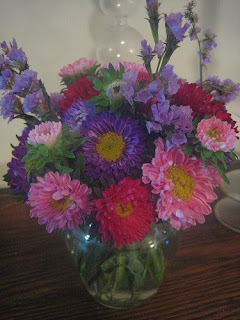 My point is, cool containers help, but they don't need to be expensive to show off a naturally beautiful arrangement. Use tea cups, tin cans (put a container inside to prevent rusting), cookie jars, creamers, beer bottles. I actually like a little contrast. A beat-up vase filled with elegant flowers like roses looks interesting, and draws your eye in. 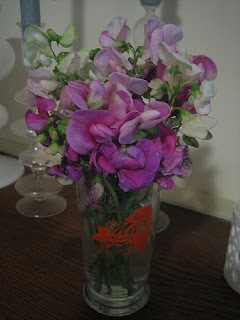 Likewise, displaying a rustic-looking bunch of wildflowers in a sleek, modern vase. A contrast of styles can turn an ordinary handful of flowers into something surprising and memorable. I was wondering where that gravy boat went? Is that why our flowers always smell so savory? FESTIVE! 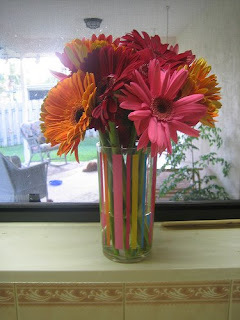 I will no longer succumb to the tyranny of the vase! Thank you Lisa, for freeing me!